If I have a recipe I’d like to bottle and sell, can you help me? Yes, Ashman Manufacturing & Distributing Company is a full-service company and we can help you with every step necessary to make your product ready to sell on the market. How do I know my secret recipe is protected? 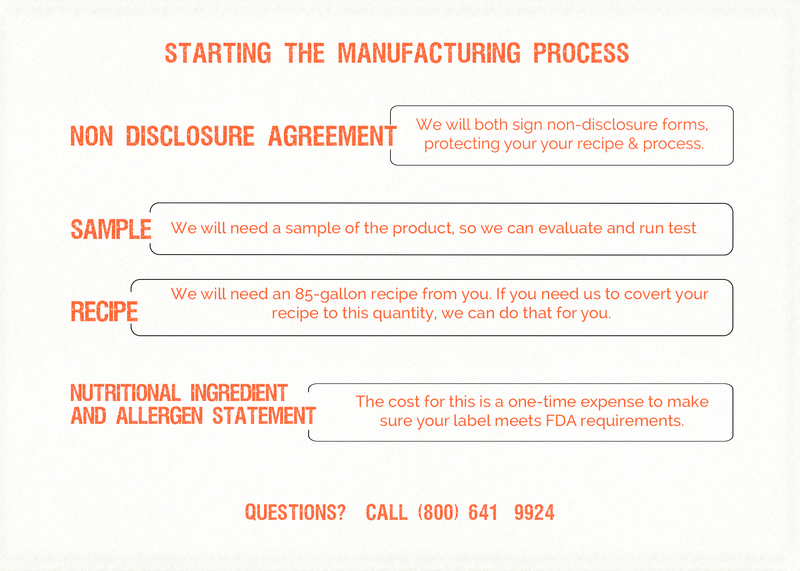 We’ll both sign non-disclosure forms to ensure your recipe stays your recipe. Two things. First, we’ll need a sample of your product for a pH test. There is a fee for us to run this test. Second, we’ll need an 85-gallon recipe from you. If you want us to develop the recipe for this quantity, just let us know, but there is a cost for this service. Are there other costs I need to be aware of? You’ll need to have a nutritional, ingredient and allergen statement done. The cost for this is a one-time expense to make sure your label meets FDA requirements. At Ashman, we go above and beyond FDA compliancy and safety so you can count on exceptional manufacturing and quality control in every stage of the process. Manufacturing your product for the first time can be a bit nerve racking, but we assure you, that by choosing Ashman Manufacturing you’ve already made a great decision. 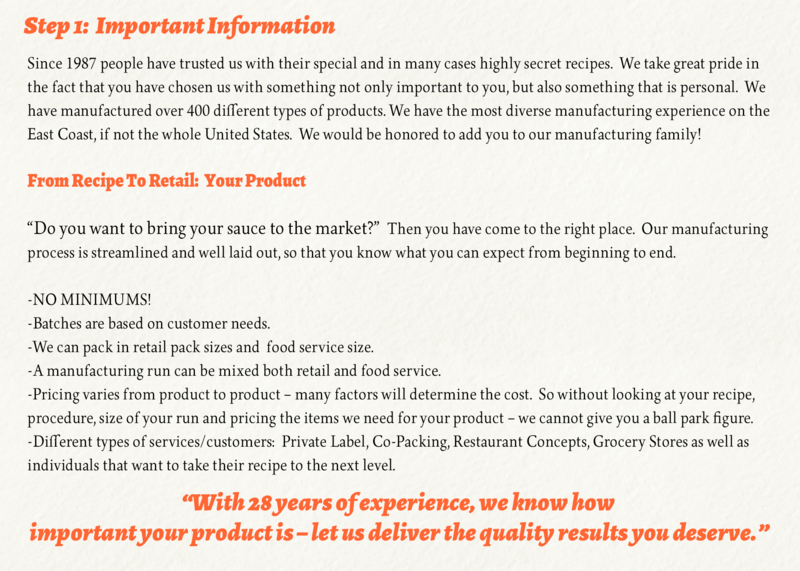 Thank you for your interest in having our company manufacture your sauces. We manufacture over 80 different sauces and have been doing it for 25 years. Your first step would be to send a physical sample of the sauce for a PH test and initial evaluation. The cost for this is $200.00. We attached a non disclosure for you to sign and return. We will do the same. The next step would be to get an 85 gallon recipe from you. If you want us to do the recipe development from your existing recipe up to 85 we can do this and we charge $200.00 per product for this work. We are a full service company which can help you with everything involved in manufacturing your product so that it is ready to sell on the market. You will need to have a nutritional, ingredient and allergen statement done when you re ready to move forward with your run, the cost of the service is $675.00 and it is a one-time expense to make sure your label meets FDA label requirements. Finally, due to the fact of food borne illness in the United State and the Federal Government’s reaction thereof, each item is required to be evaluated by a processing authority. A written procedure will be completed for each product highlighting temperature and pH guidelines to be used during manufacturing to ensure a finished safe product. The cost of this review is $675.00 for each item. A written copy will be supplied to you for your file as well as a copy held here at Ashman manufacturing for processing purposes. The review work is complete if your product falls into the high acid food category. However, if your product falls into the acidified food category it will require an extra step. This step will be to have our processing authority register your product and process With the FDA. This registration acts as a contract between you, Ashman and the FDA which is to br followed to the letter when being manufacturer. Acidifies foods require extra record keeping and manufacturing process by Ashman and comes under additional scrutiny and review by the FDA inspectors. Ashman is registered acified food manufacturing plant. The cost for the registration is $675.00 if required. We look forward to receiving your physical sample, check, and getting started with the quote process.